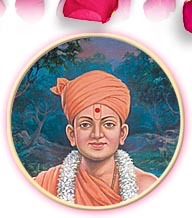 Gunatitanand Swami was the first spiritual successor of Lord Swaminarayan. He was the incarnation of Aksharbrahman, the choicest devotee of Parabrahman. Named Mulji, as a child he mirrored a divinity that was like a quiet, unwavering flame. He often preached to children and elders in a lucid language. A staunch disciple of Lord Swaminarayan, Mulji soon renounced the world and was aptly named Gunatitanand . His humility, service and saintly virtues earned him the love and respect of others. Lord Swaminarayan Himself never missed a chance to highlight the unique spiritual relationship Gunatitanand enjoyed with Him. The Lord often announced, "He is Akshar, the highest Abode. He serves Me eternally. Through him, a seeker can rise to become Akshar-roop and serve Me eternally." As the Mahant of Junagadh mandir, for 40 years, he continued the mission of the Lord. At the age of 82, he left his mortal body. His sacred place of cremation in Gondal is called the Akshar Deri. His teachings and discourses have been recorded in the scripture - Swamini Vato, read daily by thousands of devotees around the world. Life Span: 82 years (1785 - 1867 CE). From 17 October 1785 CE (Aso sud 15, 1841 VS) to 11 October 1867 CE (Aso sud 13, 1923 VS). As Guru: 37 years (1830 - 1867 CE).